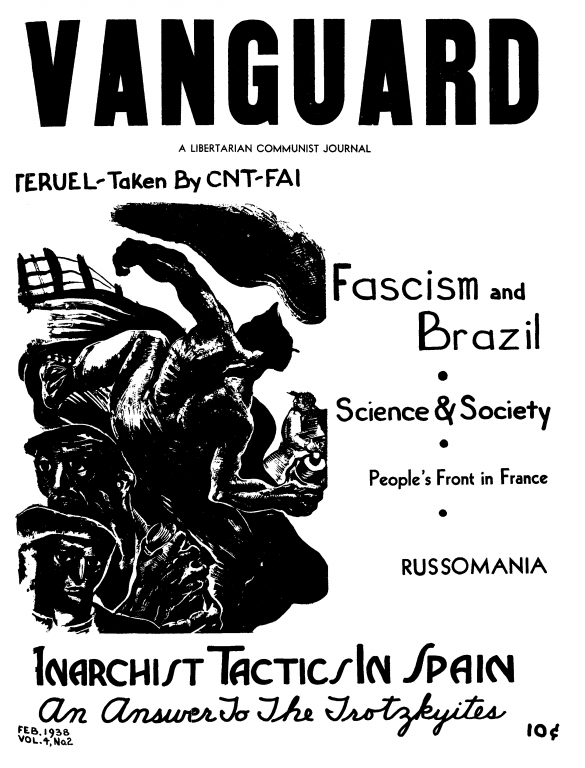 The February 1938 issue of Vanguard, an anarchist journal published out of New York, with articles by Senex, Joseph Zack Kornfeder and Arnold Roller. Joseph Zack Kornfeder was one of the folks behind the One Big Union Club along with Walter Nef. He was the former head of the CPUSA's TUUL. I knew that he was CPUSA, and then Workers Party, but didn't know that. Do you have any more information on the One Big Union Club, who they were and what they did? Very little info, although I bought a couple of the magazines, scanned and placed online. I get the idea that it was two extremely tallented organizers who could have done something but caught at beginning of WW2 and CIO. OBUClub lasted until 1940. Nef continued with an organization called "Equality Club" - if memory serves... which advocated for Belamy style socialism. That lasted into early 1960s based in East San Francisco Bay. Zack was a sad story. Was head of TUUL, went with Trots and then with RWL/Oehlerites. His wife and son were in the USSR and were held hostage when it looked like he'd go Trotskyist. His wife died in camps and son was adopted out and disappeared. Zack wound up testifying at one of the early versions of HUAC against the CPUSA. Wiki page looks like Stalin/Trotsky line, strange because looks like writen by Tim Davenport of Early American Marxism fame. No mention of OBUClub or Oehlerite membership.